I know, I know. It’s been way too long since my last post, but it’s taken me awhile to research this subject and get pictures to show you what I mean. Since I’m one of the co-owners of Free Dog, I thought it’d be a good idea to learn as much as I can about dogs. Being a dog myself, I pretty much figured I was already an expert, but as it turns out, there is a lot about dogs I don’t know. Actually, there’s so much to tell, that I couldn’t possibly cover it all in one post, so I guess I’ll start with the basics. Well, that’s up to you, but I’m gonna get started, cause there’s a lot of basics to talk about. You probably know that people are also known by their Species name, Homo Sapiens, which is Latin for wise man. Since dogs are obviously different from people, it only makes sense that we have our own Species. We’re called Canis Lupus Familiaris, which is also Latin, and has something to do with wolves. Right, sorry. Sometimes I get carried away. But I was getting back to my story when I asked about the kind of dog. Most of us dogs don’t really care about what kind of dogs we are, but since it seems like it’s really important to the humans, I started wondering about how many different kind of dogs there really are. So naturally, I asked my friend Aleksa, and Wow, was I surprised! The American Kennel Club, of which I am a Member, recognizes 167 different breeds. I thought that was a lot, ’til I kept digging (Get it? Digging? Hey, dogs like to dig) and found out that The World Canine Organization, also known as the FCI (Don’t ask me why. Probably some Latin abbreviation) says there are 340 different breeds. 340? Yikes! At first I thought it must be a mistake, but then I started looking around at all of my friends at Camp, and the other dogs I see when we’re out and about. And there really are lots of different kinds of dogs. 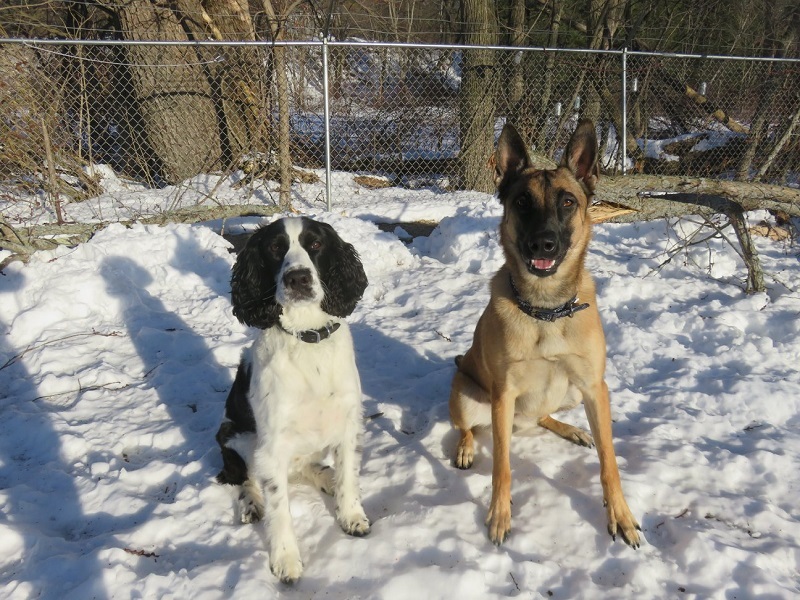 I’m an English Springer Spaniel, and am considered a medium sized dog. By the way, there are 25 different kinds of Spaniels alone. Waya is a Belgian Malinois, which is obviously a larger dog. There are really big dogs like my friend Looch, whose an English Mastiff, and really small dogs like my friend Bruiser. whose a Miniature Pinscher, and all kinds in between from tall and skinny, to low and long like my friend Willow. I’m black and white, but some dogs are all black like Retriever Buck, some are all white like Samoyed Tikva, some are yellow or brown like Labs Kelly and Finn, some are all red like Viszla Finley, some are multi-colored like Australian Shepherd Harvey and some are even striped like Khloe the Boxer. And then there’s even more combinations of all of those colors. It’s not just our size and colors that make us different. Let’s talk about the kind of fur we have. Just from the pictures I’ve already shown, you can see that some have really short coats and some have a lot more fur. Italian Grayhound Radley has hardly got any fur at all, and never needs a haircut, and then there’s Labradoodles Griffin and Sunny, who both have longer fur, only one is kinda straight and the other one is more curly. Enough about fur, let’s talk about shapes. Like noses and ears. I’ve got a sort of round head and long, floppy ears, and Waya has a skinny head and pointy ears. Then there’s dogs like Stella the French Bulldog and Sophie the Boston Terrier, who have really short noses and small ears. And the last, but certainly not least difference between different breeds of dogs is that some dogs have tails and some don’t. Waya has a long tail that wags all the time. I was born without a long tail, so you have to look a little closer to see if mine is wagging. What? I was? What happened to it? WHAT?!? You cut off my tail? Why would you do that? I don’t hunt. I don’t even like birds. Shouldn’t I have had some say about whether I wanted a tail or not? I’m not sure that makes me feel any better. I’d just like to go on the record to say that I think it’s totally wrong! Dew claws? What are dew claws? Hey there everybody. Did you know that today is National “Give a Compliment Day”? Me either, but Aleksa told me all about it in one of her morning reports to me. You’re supposed to give compliments and really mean them. And when you get a compliment, you should accept it graciously. You have told me this before, but it’s always nice to hear. Thank-You very much. And I think you’re the best Mom ever! I tell everybody, and I just wanted to make sure you knew. How come you never lick my face? Seeings how today is “Groundhog Day”, I thought I’d round up all of our Groundhogs for a Group Shot. I coulda swore we had more of them, but Waya must’ve eaten some. Yup. Cause at first I thought they were pretty much the same except that Hedgehogs have really spikey fur and Groundhogs have smoother coats, but it turns out they’re more different than I thought. 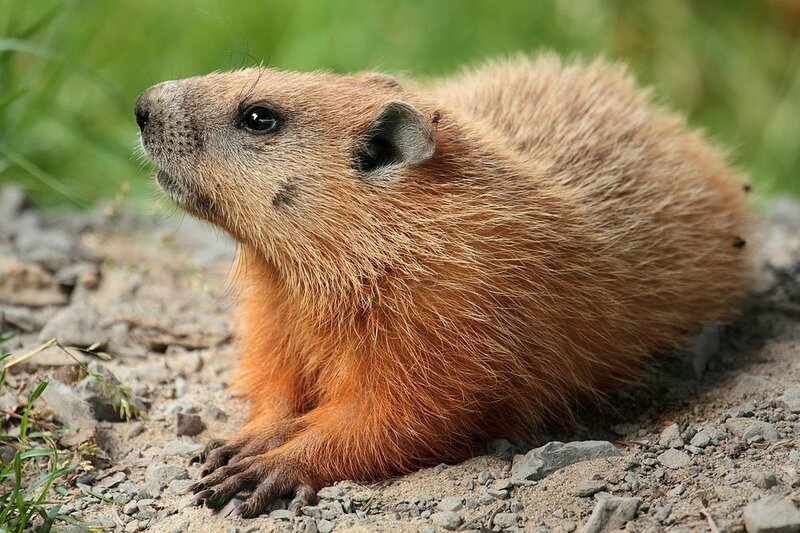 Groundhogs, which are also known as Woodchucks, are from the family Sciuridae, and are only found in Canada and Eastern USA, which is where we live. The most famous Groundhog of all is Punxsutawney Phil. He lives is Pennsylvania, and only comes out once a year on February 2nd to let us know how much longer Winter will last. If he sees his shadow, then it’ll be another six weeks, and if he doesn’t, then it’ll only be four. What? No, don’t do that. She’s really helpful. 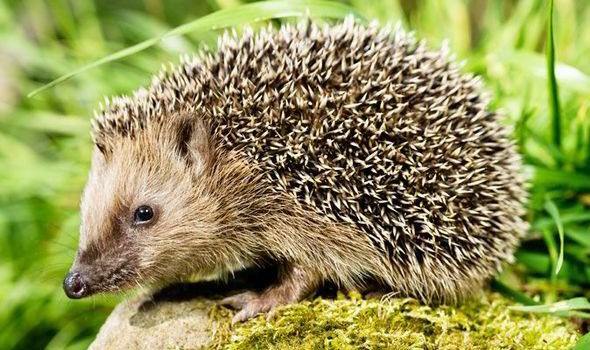 Hedgehogs are from the family Erinacinae, and come from Europe, Asia and Africa. 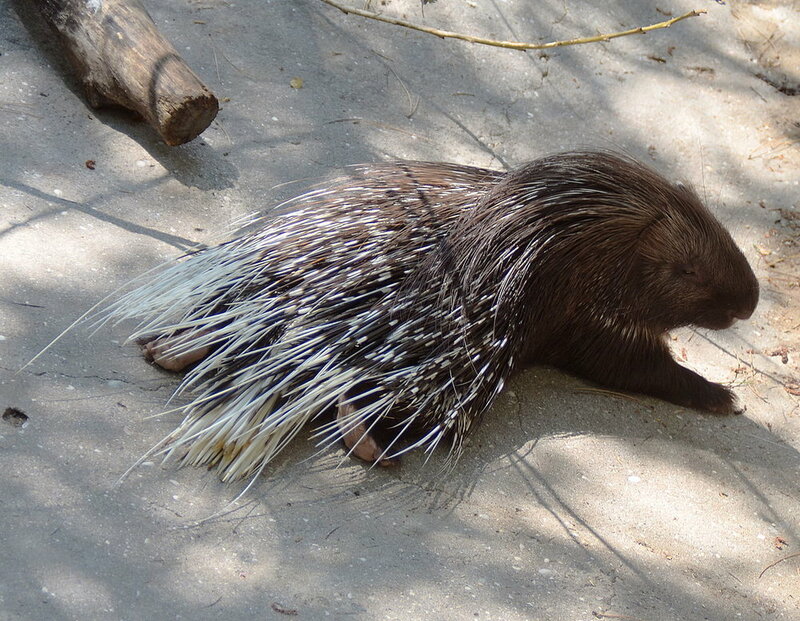 Their spikes are really called spines, and they’re actually hollow hair stiffened up by keratin. Sonic is the most famous Hedgehog. He’s really fast, so fast they’ve made three movies about him. And here’s the best part. Did you know that the smallest kind of Hedgehogs, the African Pygmy Hedgehogs, are kept as pets in some places? I’m thinking probably in Africa, but how cool is that? Maybe we could get one, what do you think? They’re really small, so he wouldn’t take up much room. Well, I’m still not really sure why, but way before we started doing it, “Hedgehog Day” was actually a Roman Tradition dating really far back in time. And I think that once we heard about it here in America, everybody must’ve thought it was a really cool idea. 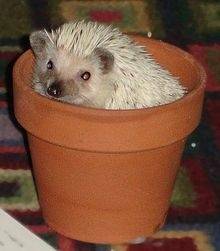 The only problem was that since we didn’t have any Hedgehogs here, they had to find another animal like them to do it. My guess is they tried a Porcupine first, cause they look the most like Hedgehogs, but that probably didn’t turn out so well, so I’m thinking they decided that the next closest animal would be the Groundhog. And let’s face it, “Groundhog Day” even sounds a lot better than “Porcupine Day”, don’t you think? You’re Welcome… And Happy Groundhog Day everyone! Fingers and Paws crossed that Phil doesn’t see his shadow. We have a bunny that lives in our yard. At first I could only smell him, and I didn’t really know what he was. Then I saw him. I’ve seen him like four times when we come home at night. He likes to hang out on our patio. Then, when I get out of the car I think he gets scared, cause he always runs away. And he always gets away, mostly cause my Mom won’t let me chase him. Yup, I remember. Good thing you guys were paying attention, too, cause all I saw was the bunny, and I was sure I could catch him. I probably would’ve followed him all the way out to the big road. I call him Buzz, cause he’s really fast, and I never know which way he’s going to run. Buzz only comes out when it’s dark, and now that I know when he’s around, I look for him out my bedroom window every morning. The other day after it snowed, my Mom came in with really exciting news. Not only were there fresh bunny tracks, but she got to see him, and even got pictures of him with the camera. I knew it was Buzz right away and begged to go outside and find him myself. She said yes after I promised not to run into the street. Yippee! As soon as we got outside I got a hold of his scent, found his tracks and followed him into the front yard. Yeah, I like bunnies. I wouldn’t ever hurt him. I thought he might be cold so I brought him in and showed him around the house. Me and Buzz are buddies. I guess he doesn’t mind the cold, though, so he’d rather stay outside, but he said we could hang out whenever all the other dogs are gone. Wow! Another year over, and time to start a new one. That means time for new resolutions. Hmmmm, what do I want to try this year? Ummmm, I remember saying that I was gonna try to be a Good Boy and listen better, and respond quicker when someone gives me a command. I know I get distracted sometimes, but I think I’ve done pretty good with that all year. I said I wanted to be a really good Frisbee player and practice every day. The only thing is, I needed my Mom’s help to do that, and she wasn’t able to take me out every day. Dock Diving? Like G does in California?? You really mean it??? You said there was a place around here, but I figured you forgot. This is gonna be great! Will we get to go every day? Cool. I can’t wait! We’re definitely gonna have to get a house on a lake so I can practice. Heck, I can even do it by myself when my Mom isn’t home. I think there was one about trying new foods, but you said I was only allowed to eat certain stuff, so that doesn’t really count. I can’t think of anything else. Right… Yeah, that was a lot harder than I thought it was going to be. I think you need thumbs to play the guitar. Oh well, like you said, most everybody never gets all their resolutions done, and now I know to keep them easier this year. Yup, I remember that. Whew! That’s been a lot harder than I thought it was going to be, too. Waya wasn’t littler than me for very long, and it was like she didn’t want a Big Brother at all. I was really looking forward to hanging out, playing and teaching her the ropes around here, but she thinks she already knows everything and always wants to be the boss. I’ve tried everything, but nothing works. I’m hoping it’ll be easier when she grows up. Yeah, hey, I know…Maybe we ought to have Waya make some New Years Resolutions, and for this year I’ll stick with learning Dock Diving and keep working on last year’s. Christmas is over, and I’m happy to report that my Letter to Santa definitely got to him in time. Me & Waya each got lots of toys, and most of mine even had my name on them, just like I asked. I think both of our favorite toys are the really bright so you can’t lose them footballs. Our Moms took us outside and played fetch with us and everything. And, most important, they both had our names on them so that Waya wouldn’t be confused about whose was whose. But you know what happened? She didn’t care. Not one bit. She stole mine right away, like two hours after I opened it, and chewed a big hole in one end. Maybe, but I’m pretty sure she just doesn’t care. She likes to wreck all my stuff and then she hoards all her stuff so I can’t play with anything. But it’s okay, cause she left her football here when she left on Wednesday, so you know what I did? What difference does it make? She’ll never know. She can’t “read”, remember? And it’s not like I’m gonna wreck it on her. I’m just playing with it cause she already killed mine. Oh, oh… Come on, don’t tell her. She deserves it. Think about all your slippers she’s eaten. Cool. I figured I’d better make the most of it. I brought it outside, and ran around, and even thought about burying it in the snow, but that would be mean. What if we got more snow and couldn’t find it ’til Spring? What if one of the Camp dogs dug it up? I know! I’ll hide it on my bed, under my blanket. I don’t think she’ll find it there. You can barely see it. What do you think? Can you believe there’s only five days ’til Christmas? I started my letter to Santa awhile ago, but I needed some spelling help, and Aleksa was unplugged so she couldn’t help me, and my Mom was on vacation, so she couldn’t help me, but I finally finished it today. I really wish Santa had e-mail, cause I’m a little bit worried that it won’t get to him in time, cause it’s so late. I don’t know about you, but I can hardly believe the Holidays are already here. I thought it was still Summertime, but all of a sudden my Mom started bringing out the end of the year decorations and props, starting with my second favorite Holiday, Thanksgiving. This year I got a new tie. Since the most important part of the Thanksgiving Holiday is dinner, we all got to fill out what we wanted to eat on our menus. I helped Waya, cause this was her first Thanksgiving, and she didn’t know about all the fixins. I told her to check off everything, cause I knew she’d want to try all of the yummy stuff, and we don’t get to have it very often. I wasn’t too sure about the cranberry sauce, but I figured I ought to at least try it. Once that was done and Thanksgiving Day was here, all we had to do was wait for Mom to cook the giant turkey. It’s important to celebrate the Holidays with family, so it was cool that Cousin Java was here to have dinner with us. She helped me keep an eye on all of the preparations since Waya was still recovering from her surgery and couldn’t hang out in the kitchen. Did someone say livvies and gizzies? Yummy! It seemed like forever, but finally, the giant turkey was done. Then we had to wait for all of our Boarders to have their dinner before we got to eat ours. I didn’t get it at first, I mean we’ve been smelling it all day, so we couldn’t wait to sink our teeth in, but I guess we wouldn’t be very good hosts if we didn’t let our guests go first. So I tried to be really patient. And boy was it worth waiting for! Me, Waya and Cousin Java thoroughly enjoyed every last lick of our plates. Waya didn’t really like wearing the “My First Thanksgiving” bib. I told her it was just the beginning. She hasn’t spent a Christmas with us yet, either. She has no idea what she’s in for when she’s feeling better. I couldn’t wait to take a nice, long, nap after dinner. Another important Thanksgiving tradition is going for a long walk so the humans can burn off all the extra calories they had for dinner. I thought that was what the nap was for. Can somebody please tell me why the humans are so fascinated with dressing up? I just don’t get it. I mean, it’s okay that they wear clothes. They don’t have any fur. They need them for protection, you know, to keep them from freezing in the Winter or frying in the hot sun in the Summertime, and getting all banged up when they fall down. Some of the things they wear are kinda stupid, but I don’t say anything. Yeah, well, nobody ever asks us if we want to wear stupid stuff either, but that never stops you guys from putting it on us anyway. We have fur coats already. We don’t need jackets. We sure as heck don’t need hats, and what’s with the glasses and mask? It wouldn’t be so bad if it was only when we’re outside playing in the cold, but sometimes it’s for no reason whatsoever. It’s like you guys get bored and “Hey, lets dress up the dogs!” I think you like embarrassing us. Okay, well what about the other two? Yeah, fun for you. How do think we feel? Let’s talk about Holidays. I just don’t understand why we have to put on silly outfits all the time. I don’t know. I’m thinking there must be some better ways to celebrate. Maybe we can just focus on what the Holidays are about. Like for Thanksgiving we eat. For Christmas we get presents. We give kisses to our Sweethearts on Valentine’s Day. And we dance to fun music on Fat Tuesday. Aren’t those good enough ways to celebrate? Why do we have to wear stupid stuff? And Halloween? Who made up this Holiday? Seriously, the only point of Halloween that I’ve been able to figure out is that everybody has to dress up like someone else. Sometimes the costumes are really creepy, and sometimes they’re funny, but one thing I can tell you is that they’re always uncomfortable. I remember being a Fighter Pilot for my first Halloween. I’m pretty sure real fighter pilots don’t wear their clothes that tight. Then there was the Panda bear and Fireman costumes. They weren’t very comfortable either, although Jazzy really seemed to like her Spiderweb Butterfly outfit. And the worst was when you sent me to the Salon and Auntie Lisa put all this yucky yellow paint on me. It took forever, then put tape all over me, and then you put on all this really strange gear and expected me to want to hang around with you. Maybe it was fun for you. You got to take off all of your scary alien gear afterwards. I can’t believe you put tape on my fur. And the yellow paint? That took like four months to wear off. Trick-or-Treating? Goodies? I’ve never been Trick-or-Treating. I like getting goodies. Can me & Waya go Trick-or-Treating? Can we? We’ll wear the silly Doctor and Nurse costumes you got us. Do you think they’re good enough to get extra goodies? What else do we have to do? So, let me get this straight. We dress up and go from house to house begging for food. If they like our costumes they give us stuff, and if they don’t we get to poop on their lawns. It does sound like fun. Maybe this Halloween thing isn’t so bad after all. How will they know it’s me? I’ll be wearing a mask, remember.